We know Apple is investing heavily in sapphire, and a new video could reveal the first product out of Cupertino to take advantage of it. A new YouTube video reportedly from a supplier in Hong Kong could offer the first glimpse at a 4.7-inch iPhone 6 front panel with a sapphire display. The four minute and 15 second video shows what appears to be a white front panel from Apple's upcoming smartphone, which is not only shown side-by-side with the latest iPhone 5S, but also sized up for good measure. 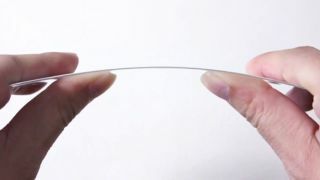 Perhaps the most interesting aspect of the video comes when the subject picks up the front panel and reveals how it flexes just a little when bent slightly between two hands, suggesting the part is not composed of the more rigid Gorilla Glass used in previous iPhone models. Apple recently invested more than $500 million (about £292m, AU$534m) into an Arizona facility that produces sapphire, but executives have remained mum on exactly what the material might be used for. Earlier rumors have suggested Cupertino may move away from Corning and the now widely-used Gorilla Glass, and tech blogger Sonny Dickson today claimed the video, which he also posted independently, showed a pre-production sample of Apple's new sapphire-based front panel. For now, that bold claim is nothing more than conjecture, although the front panel matches up with previous iPhone 6 rumors, including the 4.7-inch display size and the rounded edges shown in recent leaks. One thing missing from the video is any sign of a 5.5-inch, phablet-sized iPhone 6 front panel, although given the speed of product leaks for this year's handsets, we'd expect that to follow soon enough. Catch up on the latest with the rumored Apple iWatch!